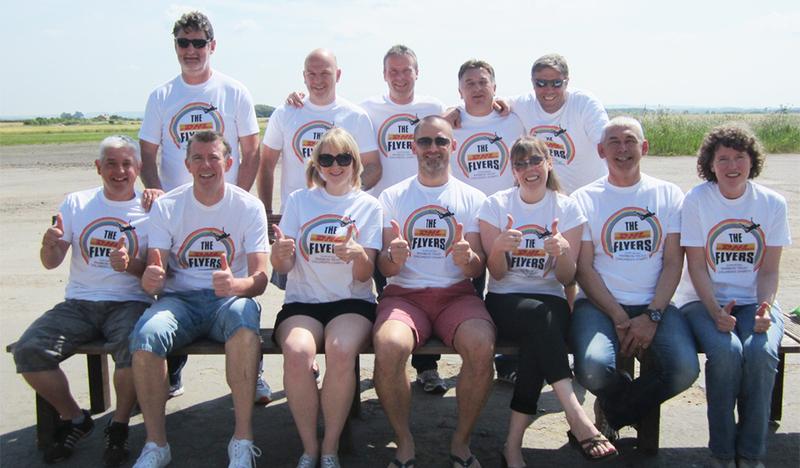 On Monday 23 June nine brave UK Senior Operations Managers from DHL (aka the DHL Flyers) took to the skies to show their support for Rainbow Trust. Denis McCarthy, Kirsty McCue, Jez Jones, Jon Brooker, Kate Hall, Francis Ktenidis, Colin Young, Barry Young and Jeff Pashley, travelled to Hibaldstow in North Lincolnshire from their DHL bases around the country to undertake tandem skydives. The team went through skydiving training before heading out to the plane, strapping themselves to an instructor and travelling 15,000 feet into the sky before throwing themselves into the air. Freefalling at 120mph before pulling the shoot and gliding gracefully to the ground, each Flyer landed with huge smiles and a new found interest in adrenalin sports! The team has been busy fundraising in the run up to their jump, raising over £5,700 so far, and as they collect in pledges they are hopeful to get over £6,000 before applying for match funding from the DHL Foundation. DHL support Rainbow Trust as their long term charity partner, as part of their extensive CSR programme. Rainbow Trust extends its thanks to the DHL Flyers for all their fundraising efforts and to DHL and the DHL Foundation for their continued support. Watch this space for the next UK Senior Operations Managers challenge!